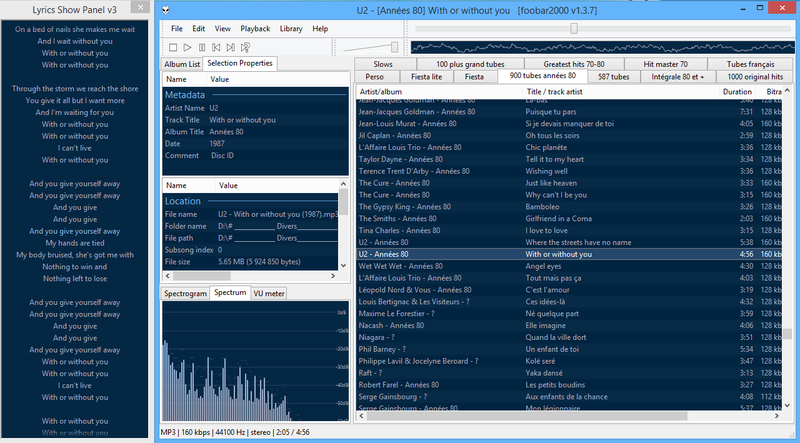 Foobar2000 est un lecteur de prime abord minimaliste. Son interface est des plus sobre avec la seule présentation d’une liste de lecture alors que la barre de progression et les boutons de contrôle peuvent n’être que des caractères textuels. Il supporte de nombreux formats sonores (notamment les formats audio d’anciennes machines) grâce à l’ajout de plugins. Cette légèreté permet bien sûr à Foobar2000 d’être l’un des lecteurs MP3 les plus léger en termes de ressources mémoire / processeur, mais il ne faudrait pas croire que cela le contraint au minimum syndical. Le fonctionnement par plugins de ce lecteur lui permet d’être incroyablement modulaire et d’intégrer un nombre impressionnant de fonctions. De nombreux formats audio en rapport avec l’émulation sont parfaitement supportés. – Worked around the disappearing window bug of Windows 10 1809. “Don’t reset DSP between tracks” now respects DSP-reported latency for proper handling of gapless albums. – Better error message when trying to open M4A file renamed to .aac. – Added %video_codec% info for Matroska and MP4 files. – Added support for PCM audio in MP4 container. – Made mouse wheel work in playlist view during a drag&drop operation. – Improved handling of classical music metadata for iTunes M4A files. – Added %bitspersample_extra% info to tell between int32/float32 PCM files. – Added support for ID3v2 iTunes Grouping field. – Made tag update operations not fail when another application has the file open for reading. – Corrected wrong bitrate shown for FLAC in Matroska container. – Corrected labels for F13-F24 keyboard shortcuts. – Fixed bugs with ReplayGain Scanner’s automatic resampling of high sample rate content. – Bumped maximum allowed sample rate to deal with DSD1024 content. – Made Media Library respect ‘include hidden files & folders’ setting in Advanced Preferences. – PPHS resampler bug fixes (inaccurate reported latency, crashing with extreme sample rates). – Fixed ReplayGain scan results showing zero peaks on near-silent 24-bit files. – New and improved buffering scheme for improved network streaming performance (ported from foobar2000 mobile). – Internet radio handling regressions from 1.4 fixed; added an Advanced Preferences setting for ShoutCast metadata codepage. – Fixed component auto update on Windows XP (1.4 regression). – Added an Advanced Preferences option to toggle asymmetric search, reverting search behaviors to 1.3 style. – Added title formatting fields for showing track/album peaks as decibel values. – Improved status feedback from batch attach album art tool. – Pressing “next” past the end of playlist now restarts the playlist even without “repeat” mode. – Added EXTM3U info writing (enabled via advanced preferences). – Added 5.1 and 7.1 upmix DSPs. – Deleting the currently playing files no longer shows error popups (1.4 regression). – Fixed repaint glitches in media library search edit box. – Updated Opus decoder to latest libopus 1.3. – Fixed a bug causing poor Default UI playlist performance with tens of thousands of item. – Fixed incompatibility with certain HTTP servers causing music files to fail to play from those servers. – Internet radio regression fixes. – Made DSP presets in the toolbar sorted. – Made technical info properly shown for various Ogg based internet radios (Vorbis, Opus, FLAC). – Fixed 1.4 regression causing incorrect detection of Internet Explorer proxy server settings. – Fixed 1.4 regression causing some tag updates to fail with ‘access denied’ when another app is accessing the files. – Fixed various 175% text size rendering glitches. 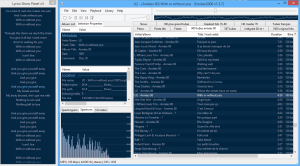 – Fixed odd behaviors while installing regular foobar2000 alongside MS Store foobar2000. – Fixed ReplayGain scanner preferences page glitches.